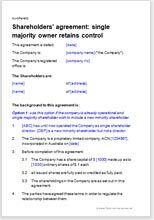 A shareholders agreement is an essential document to have in place. It takes over where company law stops - confirming the rights of the shareholders against one another and against other stakeholders in the business (particularly directors). It sets out how the shareholders intend the company should be operated. This version is drawn for a situation where a single shareholder controls (and probably manages on a day to day basis) the business of the company. There is provision for the introduction of minority shareholders, but the largest shareholder remains firmly in control. Using a shareholder agreement is one of the most efficient ways of doing this. Of course, one or more shareholders who control over 50% of the voting shares always control any company. This agreement enhances that position. It also covers a situation where the largest shareholder may have transferred shares to several others, who collectively own more than he alone does. It minimises the opportunity for a takeover by several minority shareholders. The document is suitable for companies of all sizes and in all industries. It is drawn by a solicitor with experience of problems that can occur in the management of such company. Note: It is important that the constitution of the company permits and supports this agreement. No other shareholders’ agreements for sale on the Internet are so comprehensive in their cover of legal issues, and the drafting explanations and tips supplied. In many areas, we give you complete alternative paragraphs and explain in the notes when each will be the most suitable for you. The provisions in this document are clear and can easily be edited or removed without affecting the remainder. We offer a number of agreements for shareholders. This one is based on our standard version, adapted to strengthen the control of a single member.